If you're a long-time athlete with a history of injury, or if you've ever wanted to feel like a trapeze artist, Anti-Gravity Yoga is definitely worth a try. This new kind of yoga is just one of the many emerging branches of yoga that have developed lately. Anti-Gravity Yoga sets itself apart by literally letting you soar through your poses. Now how many other sports can say that? The idea is, our bodies are constantly being weighed down by gravity, even while we're sleeping. This affects our bodily organs, joints, and general disposition. But being suspended upside down takes all the weight off from the constant pulling down to the earth. It's a relief for all your bits and pieces, causing a shift in all your bodily systems, right down to a fresh supply of blood being pumped into your heart. It decompresses your spine, relieving the discs and vertebrae from the constant pull from gravity. Accordingly, inverting yourself not only takes this pressure off the discs, but refills it with spinal fluid that keeps it spongy and renewed for years. You might be surprised to find out that it can even make you a tiny little bit taller, thanks to this realignment of the spine...seriously! 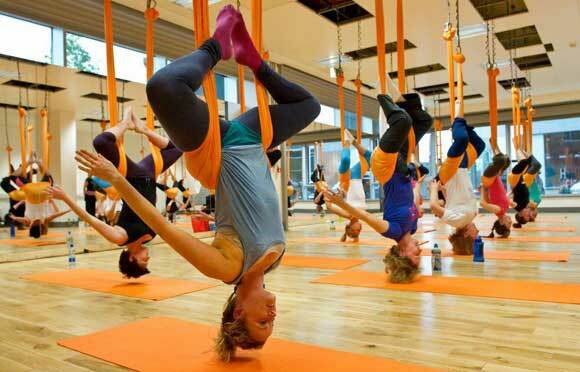 The poses you do in Anti-Gravity Yoga obviously do somewhat differ from traditional yoga poses. During your class, you will make thorough use of the many cool functions of the hammock that supports you. For example, Downward Facing Dog (Ardo Mukha Svasasana) is modified in Anti-Gravity Yoga by suspending you by the waist-hip area so that you form the perfect upside-down V-shape that the pose is meant to achieve. Even the final resting position called Corpse Pose (Savasana) has a unique Anti-Gravity Yoga twist - instead of lying on your back, you curl up into your silk hammock as if in a cocoon, and you emerge relaxed and renewed. This pose is then actually called "The Womb". There are also other specialized poses that take full advantage of the tools at hand. Soon enough you'll find yourself swinging around and wrapped around the fabric like a Cirque du Soleil performer. As long as you trust yourself, the equipment, and your instructor, you'll be playing and soaring around like you were born to fly in no time. So while it's true that an Anti-Gravity Yoga class is usually more expensive than your average yoga class, thanks to the additional equipment and general trendiness. However, an experience that lets you swing like a child again, giving you that new perspective of yourself and your body in relation to the earth might be worth the extra bucks.